LEAD JUDGMENT BY: ITA GEORGE MBABA, J.C.A. This is an appeal against the judgment of the Federal High Court, Owerri Division, in Suit No. FHC/OW/CS/77/2016, delivered on 18/1/2017 by Hon. Justice A. Lewis-Allogoa. At the Federal High Court, Appellants, as Applicants sought some declaratory reliefs for the Enforcement of Fundamental Rights. The Reliefs sought were supported by a Statement of Particulars of the Applicants and Respondents and grounds thereof, verified by supporting affidavit, and exhibits, attached. The affidavit showed that 1st Applicant, a retiree, was the father of the 2nd to 4th Applicants; that the 2nd and 3rd Applicants were students and the 4th Applicant a poultry farmer, all of Umuhua Umuodu, Owerri Nchi-Ise, Owerri Municipal Council. It also showed that 4th to 8th Respondents, who also resided in the same compound/community with Applicants, at No. 170 Tetlow Road, Owerri, reported the Applicants to the Police, which made some Policemen, attached to State Command Investigation Department (State C.I.D. ), Owerri, led by 2nd and 3rd Respondents, to arrest and detain the 1st, 2nd and 4th Applicants. Applicants claimed they were harassed, hand-cuffed and whisked away like common criminals on 11/5/2016, over false and malicious complaints made by the 4th to 8th Respondents to the Police; that they (Policemen) assaulted the 4th Respondent; that at the Police Station, they (Applicants) were stripped off their clothing’s and personal effects like phones, beaten thoroughly with matchets and sticks and thereafter detained in the Police cell; that they denied the offence alleged against them, after which the 2nd and 3rd Respondents demanded for the sum of N200,000.00 (Two Hundred Thousand Naira)as fee for their release; that when they refused to give the money, 2nd and 3rd Respondents started beating them (Applicants) again and threw them into a stinking Police cell, with no access to food, water and bath, till the next day. 1st Applicant said he was 71 years old, very ill and could hardly see or walk, and that when he told his condition of health to the 2nd and 3rd Respondents, they cared less and made him to stand for hours in the cell; that they (2nd and 3rd Respondents) later reduced the bail fee to N60,000.00, which the wife of 1st Applicant (Mrs. Immaculata Oguoma) borrowed from Mrs. Christiana Ukonu, to pay for their release; he said that after their release, 1st Applicant was hospitalized for 2 days, and was treated in the Hospital; he said that 1st to 3rd Respondents invited them again to the Police Station on 17/5/16, and they were at the Police Station from morning till 6pm on that date, without anybody attending to them, but were ordered to return to the Police Station on 19/5/16 with the 3rd Applicant; On the said 19/5/16, they all (Applicants) went to the Police Station only to be detained again; that 1st to 3rd Respondents demanded for N15,000.00 before they (Applicants) could be released; they were subjected to serious torture and compelled to pay the money, to be released. Applicants said the complaint by the 4th to 8th Respondents, to the 1st to 3rd Respondents was purely borne of malice, arising from a Quit Notice which Applicants served on them (4th to 8th Respondents) on 3/5/16; that 1st Applicant, out of his benevolence, had let out his three rooms apartment to the 4th Respondent to live with her children – 5th to 8th Respondents, upon the death of their father. He said that, on 17/4/16, the 5th to 8th Respondents had attempted to burn down his house on the instigation of their mother – 4th Respondent; that on that day he and his wife and children were assaulted and he made a complaint to the Police at Owerri Urban Police Station; he said that the Police had invited the 4th to 8th Respondents to answer to the report, but all of them went at large, except the 8th Respondent, who was arrested and arraigned before the Magistrate’s Court, Owerri, on 20/4/16 in Charge No. OW/221C/2016 (Exhibit A) and that the case was adjourned to 18/5/16. But before then, on 11/5/16, the 4th to 8th Respondents attacked the 3rd Applicant, while coming back from school, injured him terribly and he was rushed to the hospital – St. Joseph’s Hospital, Anokwu Street, where he was admitted for days. Exhibits B, B1 and B2 were attached to show the injuries on 3rd Applicant and Exhibit C was the Hospital Card; Applicants said that the 1st to 3rd Respondents invited them to the Police Station, soon after the discharge of the 3rd Applicant from the Hospital, on 18/5/16; that they (Police) have not stopped inviting them and harassing them, doing the bidding of the 4th to 8th Respondents. 1st Applicant claimed that the Police threatened them to withdraw the Charge No. OW/221C/2016 against the 8th Respondent, before they (1st and 3rd Respondents) could stop harassing them (Applicants). The 1st to 3rd Respondents had filed a Counter Affidavit (deposed to by 2nd Respondent, who was the Investigating Police Officer (IPO) in the case). They admitted that 4th to 8th Respondents made complaints against the Applicants, which they (1st – 3rd Respondents) were investigating – in the course of their criminal investigation. They attached the petition made by Udoka Oguoma (5th Respondent) to the Police as Exhibit NPF1; they admitted going to the house of Applicant to invite them for questioning, but the Applicants failed and neglected to honour the invitation; the 1st, 2nd and 4th Applicant were arrested on 11/5/16; that they were promptly granted bail after interrogation, on 12/5/16, when somebody came to take them; they said that they did not demand for money at all for bail, and exhibited the bail bond as Exhibit NPF2; they claimed that after the arrests, Applicants, on 11/5/16 attacked 5th Respondent, who lodged the complaint against Applicants. The Police averred that the No. 170 Tetlow Road was a family house of the Applicants and the 4th to 8th Respondents, but that 1st Applicant was claiming the property as his, out of greed, seeking to use force and self-help to eject the 4th to 8th Respondents; they averred that members of the extended family/community had mediated on the issue, showing that the house was a family property -Exhibit NPF4. They admitted the Applicants were arrested, but denied harassing, intimidating or treating them as common criminals; they said that upon their release, on 12/5/16, 1st, 2nd and 4th Applicants were required to report to the Police on 16/5/16, but they failed to do so; that they were further invited to the office on 17/5/16 and they did not report, talkless of being detained on 19/5/16, or being made to pay N15,000.00 or any money, for their release. They (Police) said 5th to 8th Respondents did not assault 1st Applicant and his wife on 17/4/2016; that Exhibit A did not reveal assault on the 1st Applicant, his wife and children. They averred that the 3rd and 4th Applicants went on reprisal attack on 5th Respondent, on 11/5/16, after the arrest of 1st and 2nd Applicants; they said that after the release of Applicants, they did not report back to the Police; they said that Applicants rushed to Court for this fundamental rights claim, when the Police was about to arraign them, on discovering offences against them. The 4th to 8th Respondents also deposed to a Counter Affidavit, denying the claims of the Applicants, except that they lodged complaint with the Police (as stated by the Police); they also asserted that the property, No. 170 Tetlow Road, Owerri, was their family house. The 5th Respondent stated that the photographs of 3rd Applicant (Exhibits B, B1 and B2) showed the injuries he (3rd Applicant) had, when he was attacked by a rivalry cult. He denied Applicants’ claim of harassment, intimidation and detention by the Police; they added that they were not liable for whatever the Police did, as they merely exercised their constitutional right of reporting a crime to the Police, and had no powers to teach or control the Police on how to carry out their investigation of the complaint. After hearing the case and the addresses of Counsel the Federal High Court dismissed the Suit of the Applicants (Appellants), a Fundamental Rights action, that same had failed. Dissatisfied, the Appellants appealed to the Court of Appeal. 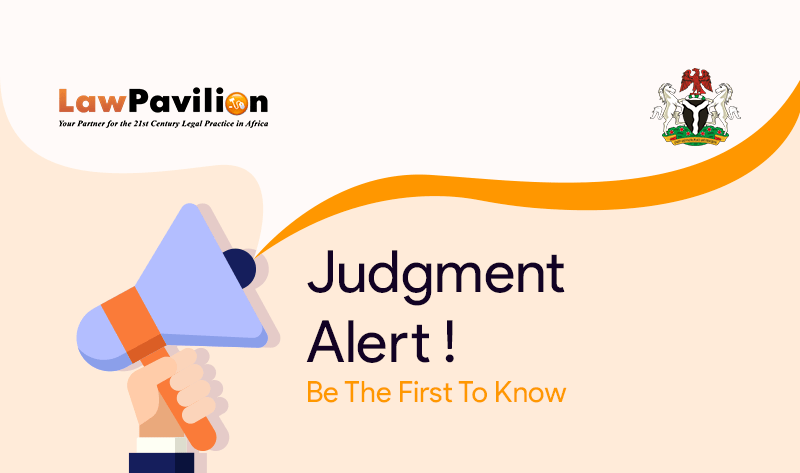 (1) Whether the trial Court properly evaluated the issues raised and evidence adduced in the case, including the Exhibit NPF1, before reaching its conclusion, dismissing the fundamental rights claims of the Appellants? (2) Whether, upon the finding that the 1st to 3rd Respondents (Police) acted within the bounds of their statutory duties in the arrest and interrogation of Appellants, and dismissing the claim against them, the trial Judge was right to stop further consideration of the possible culpability or liability of the 4th to 8th Respondents, who lodged the complaint against the Appellants in the case.